Tryouts can be more nerve-racking for parents than the Little Leaguer®. After registration, skills evaluations are the next step in getting back on the field. To have teams, you need players and evaluations is how MPTLL assesses a child’s baseball and softball abilities. At evaluations, the league will have bats and helmets available for players to wear, so there is no need (yet) to go out and buy new gear. For now, getting your player prepped for what to expect when you arrive is the first priority. As you prepare for tryouts, check to see if your player’s hand still fits in the glove and if the glove is still in good shape. If it looks like it can handle another season, loosen it up with some glove oil. If possible, try to find a place where you and your Little Leaguer can throw a ball. Simply having a game of catch will help to wake up the muscles and remind the body and mind that spring will soon be here. By the time tryouts arrive, MPTLL has compiled a list from registration that organizes the players by age. 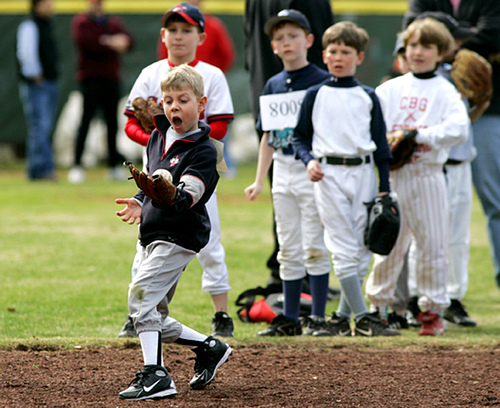 Players league age 4 and 5 typically play T-Ball and do not need to tryout. 6 year olds will play coach pitch and a small number of 6 year olds will try out for our machine pitch. If your child is seven or older, the tryout will involve consist of running, throwing, catching and hitting. A tryout typically takes 90 minutes to two hours depending on the number of players in attendance. Each player who is age-eligible for the draft must attend one of the scheduled tryouts to be considered for a Major Division team. Each player will be evaluated and assessed with a grading system established by MPTLL league officials. It is typical that each player will receive a grade based on ability, aptitude and age, but MPTLL decides how it will evaluate players. Following tryouts, the players will be placed into a draft pool that managers/coaches will use to choose from to determine their teams for the season. MPTLL always offers multiple tryout dates. Players can tryout more than once and they can also tryout for different divisions. If a player is unable to attend any of the scheduled tryout dates, the MPTLL Board of Directors can consider other options to evaluate a player, but this would require a special circumstance (illness, injury, inability to attend) that is explained to the Board prior to the tryout date(s). At the time of tryouts, each league has already selected their team managers. All potential managerial candidates are invited to evaluate at tryouts. With a large volume of kids attending, tryouts can be an overly enthusiastic, energized hustle of activity for both the player and parent. A solid piece of parental advice is to remember that your player will not be in mid-season form. When quietly watching your son or daughter, have realistic expectations and remind them to do the same. Reserve any judgments and do not criticize their performance. Remember, it is a long season, so start it off right with a high-five, pat on the back, and “good job” regardless of how your child performs at tryouts.